At ThoughtMatter we can attest to the power of posters to amplify voices. Action isn’t just about doing something the right way — it’s about doing the right thing right now. Posters often attract the world’s attention in a way televised speeches and feature documentaries cannot ­ — a few words summing up a world of passions and beliefs. An entire movement’s fury and frustration, hope and healing can be contained in the few moments it takes to read a poster. To us, posters are a beautiful paradox: fleeting but lasting. And the political influence they wield isn’t lost on us. Now that the posters our design team created in support of the March For Our Lives are on display at Poster House, we couldn’t help but reflect on the tremendous impact poster design has had on us as a studio. 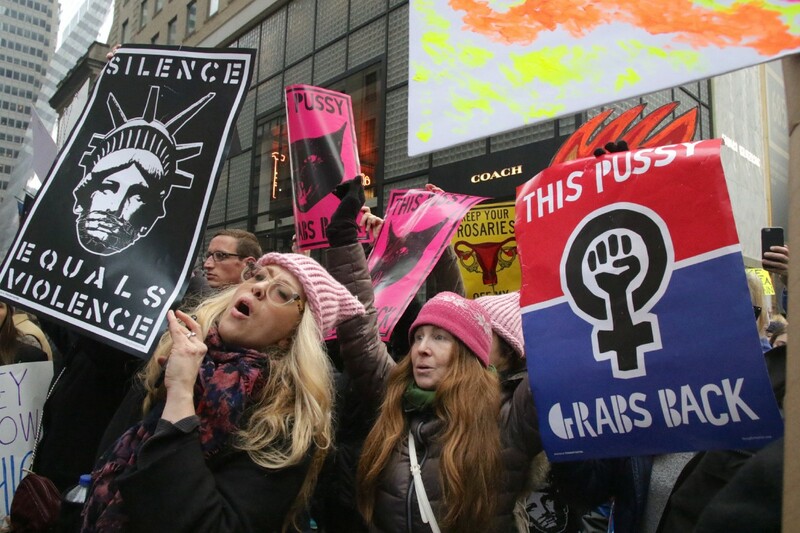 Plans for the inaugural Women’s March started percolating shortly after the shock outcome of the 2016 Presidential election. That’s when our Chief Executive Tom Jaffe rallied the despondent ThoughtMatter crew in a meeting where he stressed the importance of using our creative talents to stay engaged. 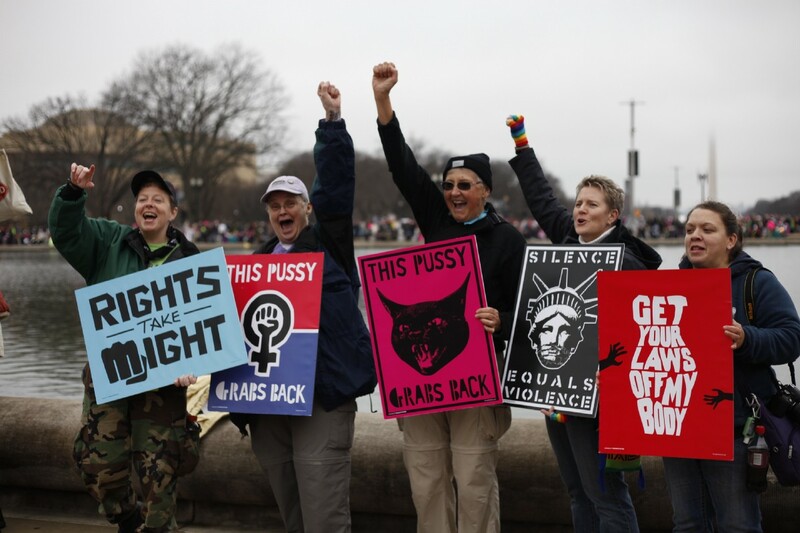 To that end, we saw an opportunity to amplify the voices of participants in the Women’s March on Washington by putting posters directly in their hands. We got to work right away, successfully channeling our creative energy into an expedited design process that was later profiled in The New York Times. After fitting into just three weeks work that typically takes months, we came up with 10 designs we hoped to distribute to Women’s March supporters. If we raised $1,500 through a Kickstarter campaign, we could print and ship 1,000 posters to people participating in the D.C. march and other satellite marches across the country. We ultimately raised more than $7,000 and printed and shipped 15,000 posters. The U.S. Constitution has been vitally important since its ratification in 1787. But in 2017 the document gained renewed cultural relevance due to the increasingly bitter divisions that define the current American political climate. We started the For the People project to redesign the 230-year-old document and spark a dialogue about civic engagement. What began as a redesign initiative, however, quickly grew to be much more. 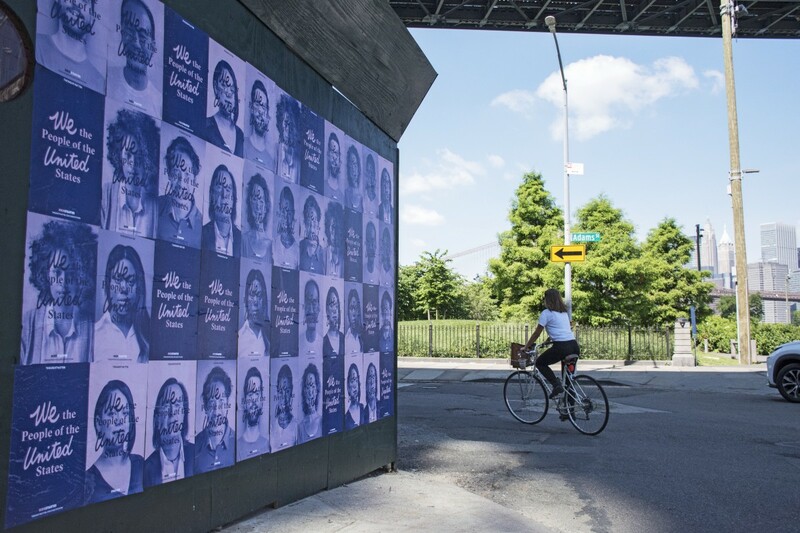 In planning our awareness campaign to build excitement around the For the People Project we even took to the streets of Brooklyn, where we wheatpasted promotional posters in pedestrian-heavy areas. National Constitution Day (September 18, 2017) gave us a timely opportunity to generate more momentum around the project. 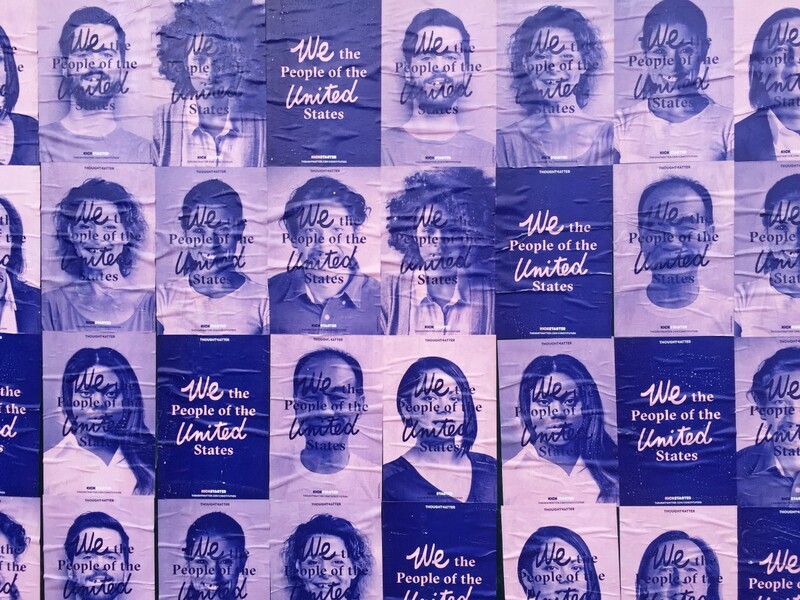 We teamed up with Mirko Ilić Corp., The Constitutional Sources Project (ConSource) and The Cooper Union to organize the We the People Poster Exhibit and celebrate the Constitution. We curated posters donated by 12 prominent designers from across the nation, including Milton Glaser, Jessica Hische, Edel Rodriguez and Jonathan Key. Each designer took on the challenge of creating a poster about either one of the amendments that make up the Bill of Rights or the Constitution’s Preamble. The work was on view at the Cooper Gallery in NYC during Constitution Week (September 18–23), and then the successful show was extended an extra week. The posters will be on display at the New-York Historical Society by the year 2020. 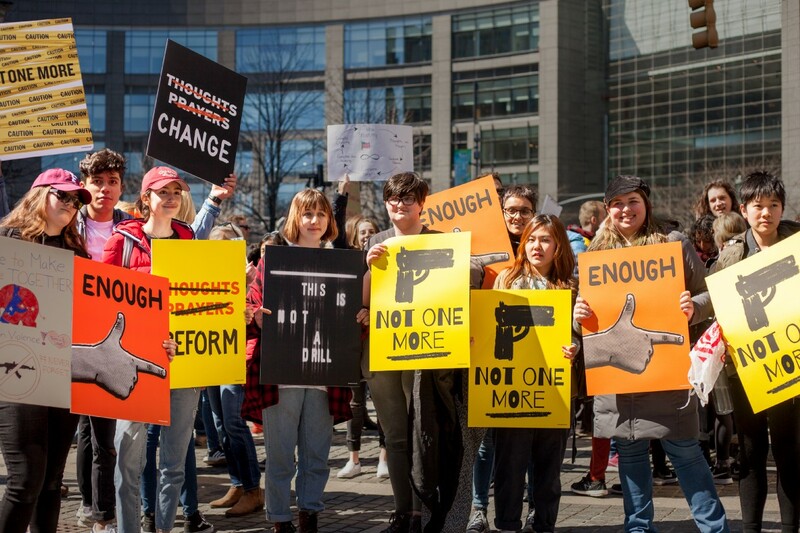 This year’s March For Our Lives movement was a collective, nationwide reaction to a horrible tragedy. We realized that the time had come again for us to use design to galvanize meaningful action. As seasoned poster-makers, we were driven by the need for a swift response, and the call-to-action was immediate. 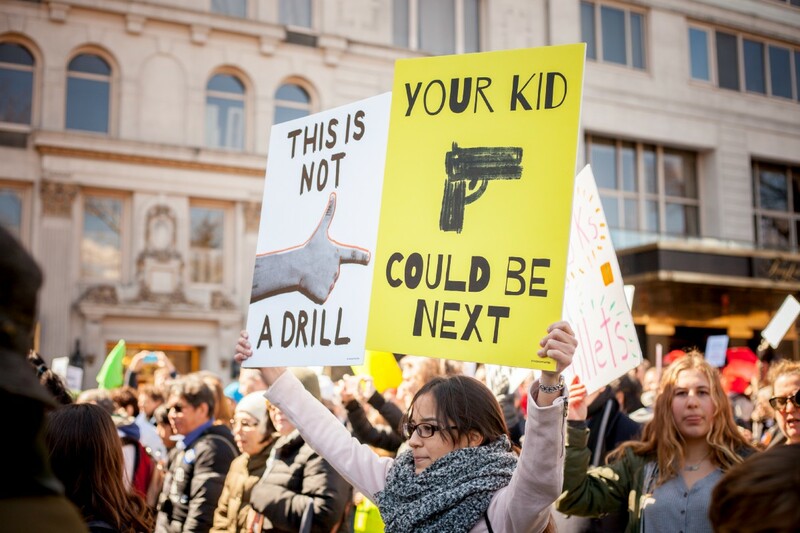 As soon as we learned about the February 14 shooting and the planned demonstrations on March 24, we set the wheels in motion, designing the posters, and making them available for free download among young marchers — all within two weeks. 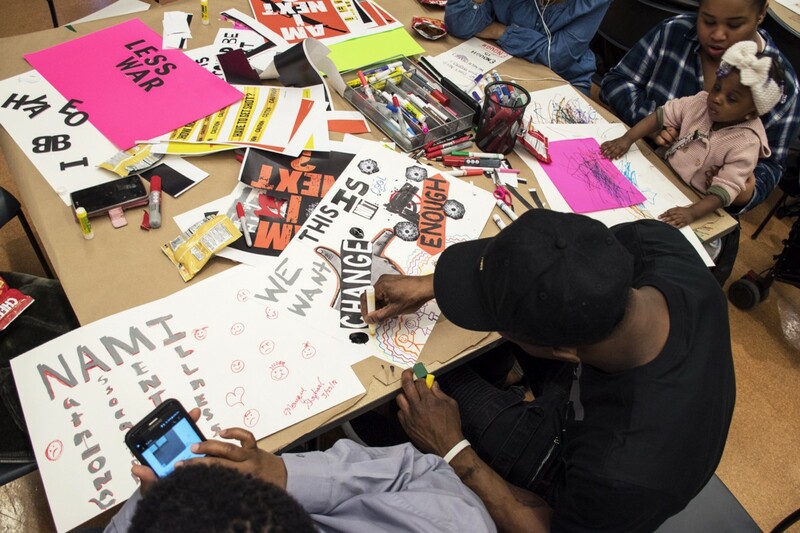 On March 23, the day before the March For Our Lives, we hosted a pop-up poster-making workshop with students in partnership with the Teen Program at The Metropolitan Museum of Art. Parents and children sitting side by side, cutting out icons and letters from our posters to repurpose into their own creations was a sight to behold — a cross-generational wonder. We’ll never forget the collective energy of hope and determination that filled the room. We’ve said it before and we’ll say it again: the Met serves as a stellar example of an institution trying to engage with a new generation of museumgoers by harboring grassroots movements like this. 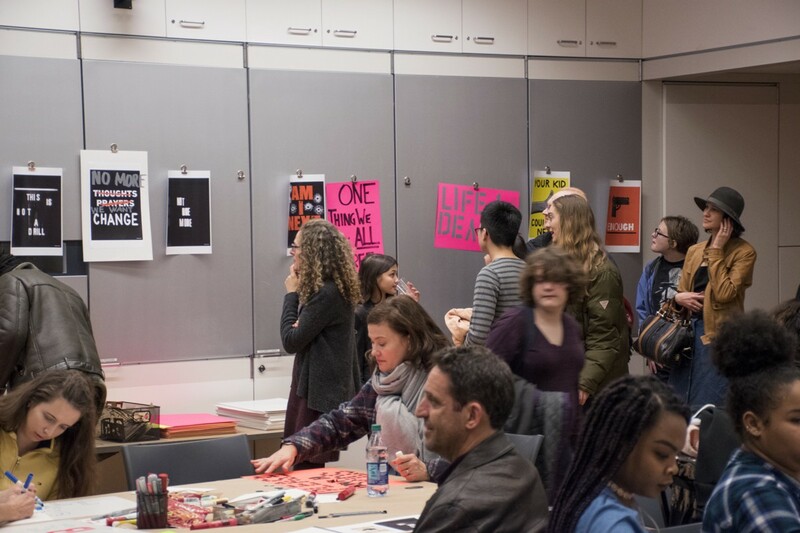 Aside from featuring at the Met’s poster-making workshop, our posters for Women’s March and March for Our Lives are now in the archives of the New-York Historical Society, Poster House and the Design Museum in London, UK. Their archival represents the powerful idea that posters are prized relics of protest. Our angry Facebook statuses and ironic memes will eventually get lost in the deep crevices of the Internet, but posters — in all their bold, eye-popping, tangible glory — are forever. The revolution will indeed be printed. 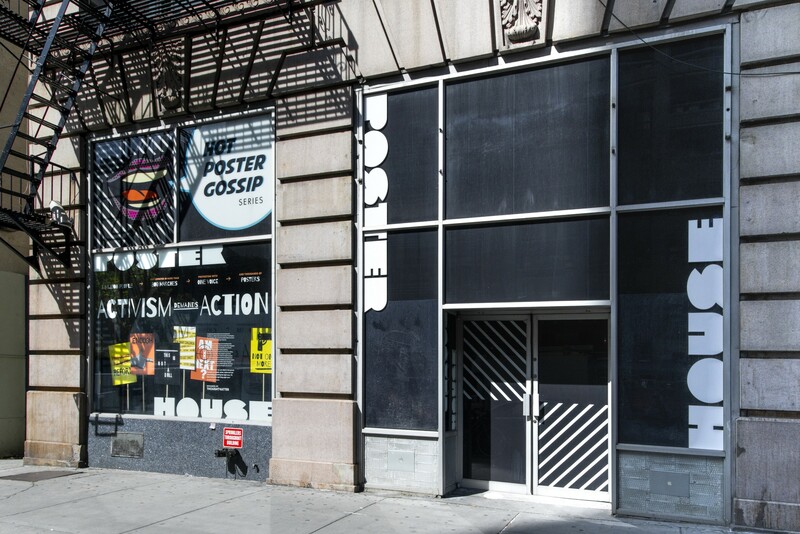 The posters we created in support of the March For Our Lives are now on view on the windows of Poster House as part of their May installment of the Hot Poster Gossip! series. Be sure to stop by 119 West 23rd Street to see it in person. 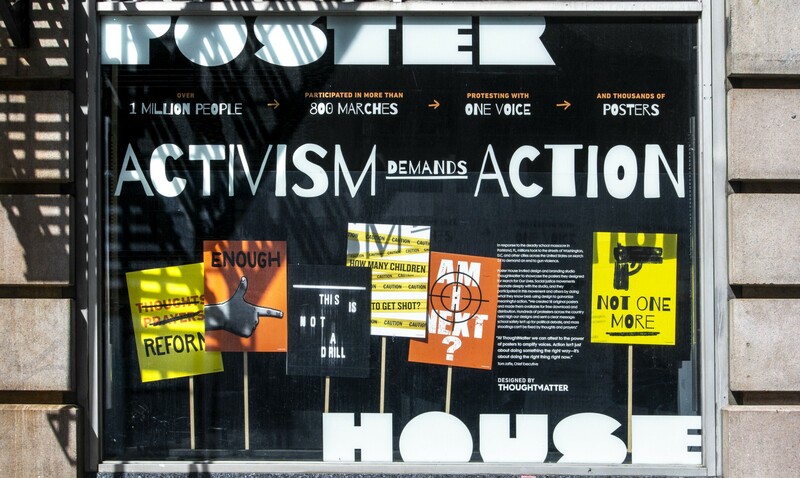 If you’d like to learn more about the vision, process and values behind our participation in social movements, our interview with Poster House is now up on their blog here. This post was written by ThoughtMatter Cultural Strategist Shivani Gorle. ThoughtMatter is a creative branding, design and strategy studio in New York City’s Flatiron District. Find us on Twitter.